Description: This is a ridged 1.125 inch spline diameter, 10 spline Clutch disc. Replaces: 207784, 70207784. For tractor models B, C, CA, D10, D12, D14, D15, H3, HD3, I500, I600 and IB 207784, 70207784. This part is not interchangeable with 70232239 as the hubs are different. New, aftermarket Allis Chalmers D15 Clutch Disc for sale with a solid manufacturer warranty. In addition, we have a generous 30-day return policy if this item needs to be returned for any reason. Please see our Parts Warranty and Return Policy links on your left for complete details before returning. Most Allis Chalmers D15 transmission problems can be traced to parts that the average person can change by following instructions provided in the service manual for your tractor. If there is a funny smell coupled with limited acceleration, most likely your clutch is slipping. Try and adjust the clutch to see if this is all that is needed. If it doesn't help, or the smell is accompanied by a scratching noise, you need to replace the Allis Chalmers D15 tractor clutch disc, pressure plate and throw out bearing. 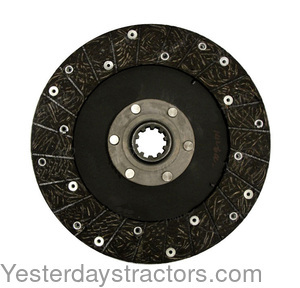 ABOUT THIS PAGE: You are viewing the product page for our Allis Chalmers D15 clutch disc. As one of the largest suppliers of new and rebuilt Allis Chalmers D15 tractor parts we most likely have the clutch disc you need. Use the information above including the clutch disc part number and picture (if available) to assist you in making your decision to purchase. If you are looking for a different clutch disc, or have trouble locating the Allis Chalmers D15 parts you need, we have MANY parts that are not listed on our website so feel free to contact us.